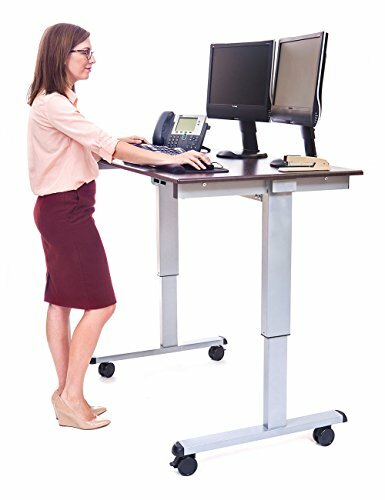 Why get a standing desk with wheels? Sometimes you need a desk that can go! 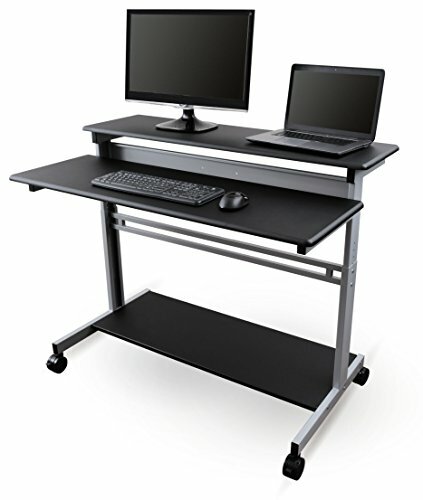 Many standing desks, from full-size (60″ wide) to micro come with wheels. In this review, we’re looking specifically at standing desks that come with lockable caster wheels on the bottom. If you’re choosing a desk for a home office or cube farm, you might think you won’t get much use out of the wheels. However, having wheels can be useful for all those times when you need to add a new monitor, re-arrange desks, move to a new part of the office, etc. 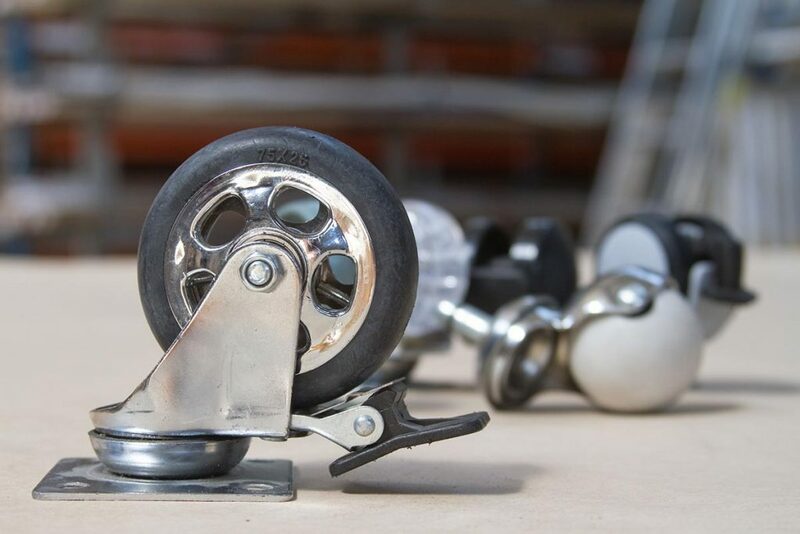 Since wheels don’t compromise stability (much), it’s worth considering the option. Full-size standing desks are heavy – usually over 100 lbs once loaded. If you ever want to run some new cables or move the desk a few feet to the left, wheels make that a lot easier. Nearly all standing desks with wheels have a locking mechanism, and stability isn’t compromised. Desks on wheels are much easier to move. 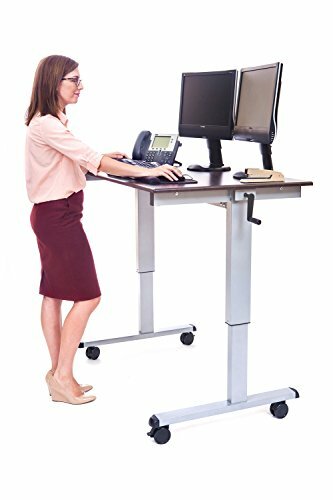 Choosing a standing desk on wheels would be particularly useful for offices that tend to move workers around every so often. A desk on wheels is much easier to push down the hallway and might be the difference between moving your own desk and having to wait for the office maintenance crew to move it for you. We didn’t notice any significant decreases in stability on desks with wheels vs. without, especially with ordinary office equipment (two flat panel monitors, keyboard, mouse, note pads, Nerf guns) on top. We also didn’t notice any significant difference in costs. So, if you think there’s any chance you’ll want to move your desk’s physical location, consider a desk with wheels. A high enough max height for you – some desk names start with an inches number, like “60” stand up desk”, but in our experience that 60″ is often the width of the desk, not its max height. Look carefully. The best of the best, the cream of the crop – the Luxor Standup 48″ Height Adjustable Electric Standing Desk has everything you could want, including convenient electrically-assisted lifting/lowering so you don’t have to turn a crank for a minute straight. It comes in numerous color palettes, from all-dark to all-light, with some wood grain options, too. It’s 48″ wide, which is probably enough for most people, but if you’re like us and you live at your desk, you might love the extra foot of width on their 60″ version, the Luxor Standup 60″ Height Adjustable Electric Standing Desk. This desk comes in many different color palettes, so be sure to check ’em all out and see which one matches your office’s decor best. They also make a hand-crank version of this desk (the stock photo looks exactly the same – look on the right side of the desk for the crank) but it’s surface area is significantly smaller than our top pick in the hand-crank category, below. If you’d rather have a 47″ wide hand-crank desk over a 59″-wide hand crank desk for the same price, go with this one. Otherwise, keep reading for our (wider, deeper) top pick in the hand-crank category. Yes, the stock photo for the Luxor Standup version looks exactly like the Luxor standup desk with the electric-assist lift. The only real difference is the hand crank on the right side. 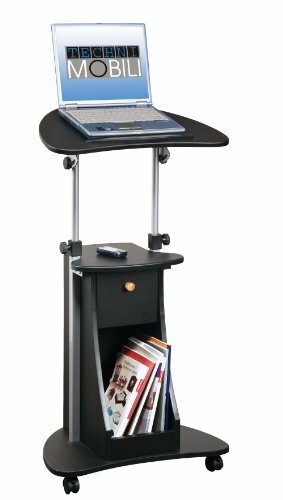 In your searches for an electric-lift standing desk, you might come across the Stand Up Desk Store’s similar offering, the 60″ Electric Stand Up Desk. This is a fine desk, but we didn’t choose this desk as our top pick because at the time of this writing this desk does not ship with Prime, so you pay around $50 to ship this behemoth. You’d be better off buying a Prime membership, getting the Luxor, and enjoying the other benefits you get from Prime for the year. If you still want a full-size adjustable desk on wheels but you don’t need the bells and whistles of a motorized lift, take a look at the rather generically-named Crank Adjustable-Height Standing Desk from the Stand Up Desk Store. It’s got a nice, huge working surface (59″ wide x 29.5″ deep) and cranks up to a maximum height of 45.25″ (lowest height is 29.5″). The big working surface is why we rank it above the Luxor Standup Hand-Crank desk (see above). It comes in numerous color palettes, ranging from all-black to wood grains to all-white. A hand-crank can be a bit of work, and it’s about 40 seconds of crank twirling to switch between sitting and standing heights. The crank is conveniently located on the side of the desk, rather than on the top where it eats up precious surface space. 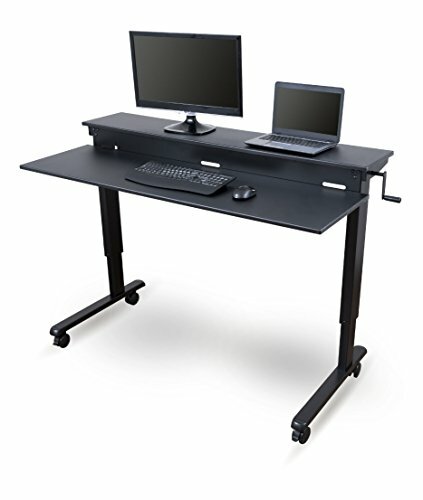 If you’d rather have a hand-crank desk on wheels with a split surface, check out the Stand Up Desk Store 60″ Crank Steel Adjustable Sit to Stand Up Desk. This split-surface desk isn’t our top pick for this category because it’s a bit pricier than the LUXOR Standup-CF48-DW and we generally prefer one-big-desk to two-narrow-desks. Maybe you don’t need an adjustable standing desk at all. 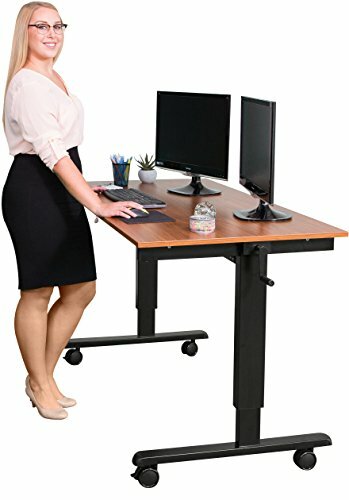 Adjustable sit/stand desks cost more than standing desks that are really only meant to be standing desks, and you might prefer using a standing-height chair instead. In that case, check out the Mobile Ergonomic Stand up Desk Computer Workstation. It does exactly as it says on the tin: it’s mobile, it’s ergonomic, and you’re probably going to use it with a computer. It’s a split surface desk, though, so if you’d rather have one big tabletop, take that into consideration when choosing this desk. It only does “standing” heights, but if you don’t need a desk that can be both a sitting desk and a standing desk (or you BYO tall chair) then you can pocket hundreds of dollars in savings by going with this desk instead. The minimalist design of Techni Mobili’s “laptop podium” has made it a popular choice for folks who need to save space. When we say laptop-size, we mean “a laptop is the only thing you’re going to fit on this desk”. There’s not even room for a mouse off to the side. That makes this desk a good choice for short-term uses, such as presentations in a classroom or shared office space, or a convenient place to park your laptop while you work in the kitchen. It’s probably not a great place to spend every single work day. It’s little but it’s got all sorts of uses, from the classroom, to the kitchen to office meeting rooms. Still, this desk has its place and it’s one of the best sellers among visitors to this site. No obvious place to put a PC tower – Notice the stock photos make no mention of a PC tower with all the attendant cables. If you’ve got a wired keyboard and mouse, you might find their cords aren’t really long enough to reach a PC tower that sits on the floor. I’ve solved this problem in the past with a night-stand size piece of furniture or shelving underneath the desk, and you may have to get similarly creative. All of these desks require some assembly from you – most can be put together in under an hour, but you’ll probably want a helper (or at least some moral support) when moving large pieces of furniture around. There is a small but noticeable effect on stability with some desks. This seems to come down to weight – if you put a lot of heavy stuff on your wheeled standing desk, you’ll probably end up with something more stable than a non-wheeled desk that isn’t loaded down with stuff. You may still need monitor stands. When standing, you may find you need to elevate your monitor even higher than they can go by default. The good news is, monitor arms have come down in price considerably in just the past few years. Some good choices here are the Mount-It! MI-705 and the 2-monitor supporting VIVO Dual LCD Monitor Desk Mount Stand. We think standing desks with wheels are absolutely the way to go; they’re just as affordable as non-wheeled versions, there’s minimal sacrifice to stability, and the increased portability is a huge help every time it’s time to change offices at work or re-configure the home office.